It seems like every time I write my Flowerona reflects blog post, I say that it’s been a busy week. 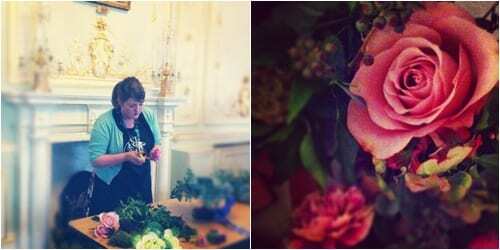 Last Saturday, I was invited to attend florist Jay Archer‘s first Crafternoon Tea Workshop at Fetcham Park in Surrey. I had such a lovely afternoon and plan to blog about it next week. But in the meantime, here are a couple of photos showing Jay demoing, and a peek at the floral heart which I made. On Sunday, apart from an early morning yoga class and bits ‘n’ bobs around the house, I put together some blog posts, as I knew I wasn’t going to have much time during the week. After a ‘stay at home’ day on Monday, on Tuesday I travelled into London to attend the Laura Ashley Spring/Summer 2013 Press Day, which I’ll be blogging about shortly. In the afternoon, I met up with the lovely Fiona Humberstone from Flourish for a cup of tea and a delicious chocolate tart at the cafe in Liberty. Next stop was Anthropologie in Regent’s Street. 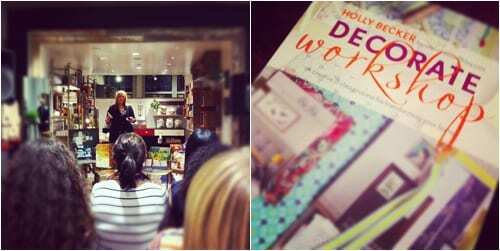 Holly Becker from the blog Decor8 was having a book launch party for her second book, Decorate Workshop. It was wonderful to meet up with Holly again and I was overwhelmed and very touched by her lovely comments about Flowerona. This is a lady who’s been blogging for over six years and has a daily global following of over 48,000 readers! Up early to go to the College Day at New Covent Garden Flower Market. Over 500 students were attending the event. There were competitions and also a wonderful floristry demo by the Jane Packer team. I’ll be blogging about it shortly. 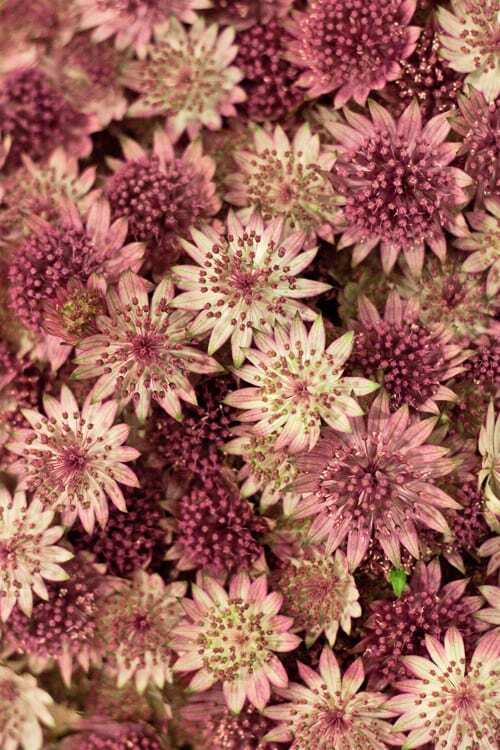 Whilst I was there I also took a few photos of some of the stunning flowers on Bloomfield’s stand, including the dainty astrantia in the first image in today’s blog post. Then it was a quick dash across London to the Country Living Fair to attend another floristry demo by the Jane Packer team. I had a look around all the stands as well, to get inspiration for magazine articles. And it was lovely to meet embroidery artist Jo Butcher and see Poppy Treffry again. A busy day writing blog posts and dealing with emails. In the evening, I went into London to attend a bloggers’ event organised by Easyart, an on-line retailer of art prints and framed pictures. And Will Taylor of the blog Bright Bazaar told us about his top five blogging tips…which I’ll definitely be putting into practice. 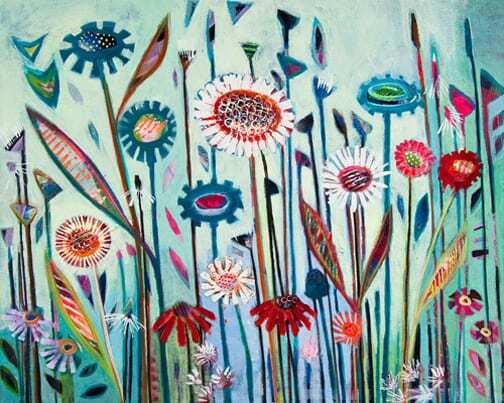 From the prize draw at the event, I was thrilled to win this lovely ‘Misty Mood’ print by artist Shyama Ruffell. Wrote blog posts and dealt with emails in the morning. Then in the afternoon, I travelled in to London to meet up with Alicia Schwede. Alicia was over here for a visit from America. 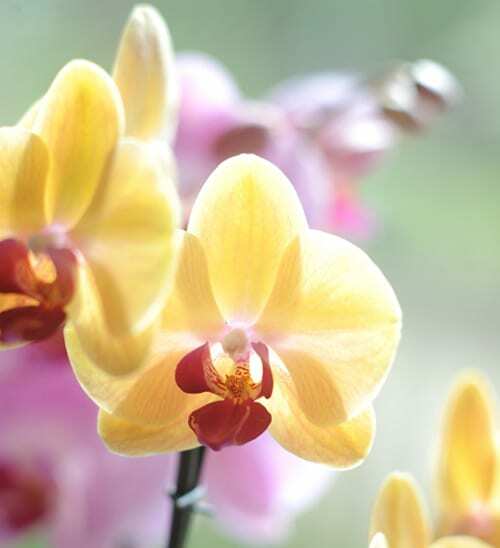 She writes a blog called Flirty Fleurs, which is all about flowers and the floral designers who make them into art. It was so lovely to meet up with her and talk about all things floral and blogging related. The most popular blog post this week was ‘Poinsettia Christmas table design by florist Rebel Rebel – Restoration Christmas’. 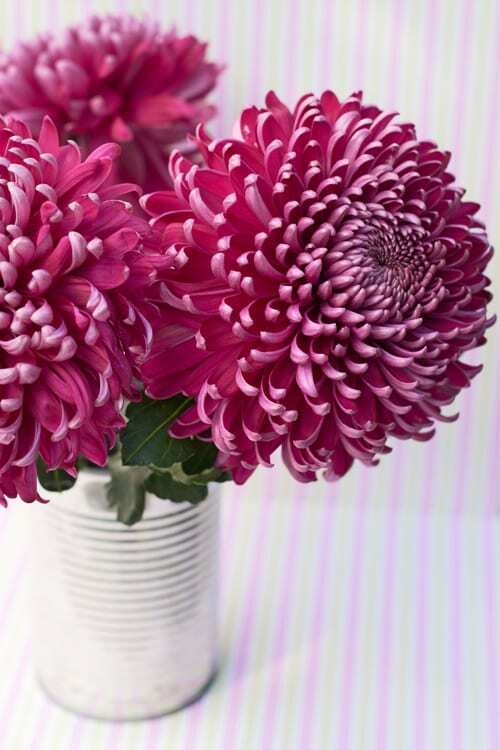 On the Interflora blog, I featured Chrysanthemums. So, that’s a round-up of my week! 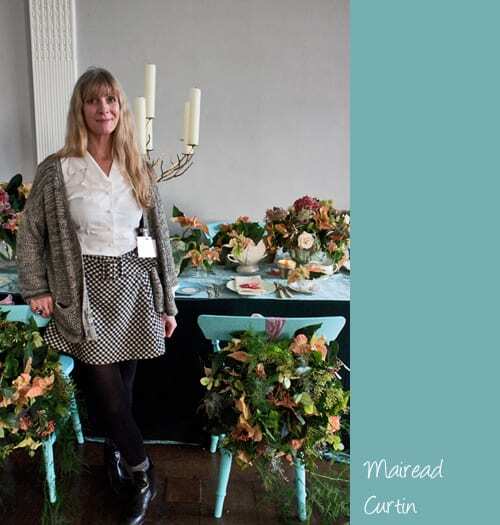 I feel very lucky to have met up with so many truly inspirational people…both in the worlds of floristry and blogging.